HONOLULU, Hawaiʻi - The court affirms the state decision to issue a Conservation District Use Permit to the University of Hawaiʻi for the building of the Thirty Meter Telescope on Mauna Kea. UPDATED to include preliminary analysis of the ruling (below) and responses from state leaders and TMT opponents. (BIVN) – The Hawaiʻi Supreme Court has ruled in favor of the Thirty Meter Telescope permit, paving the way for the $1.4 billion observatory to build on Mauna Kea. 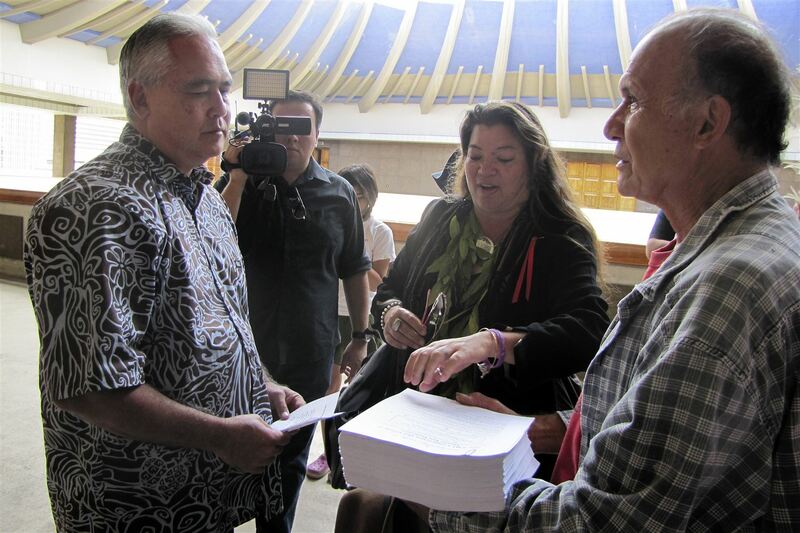 Chief Justice Mark Recktenwald, Associate Justice Sabrina McKenna, and Circuit Judge Jeannette Castagnetti (in place of recused Associate Justice Paula Nakayama) – with Associate Justice Richard Pollack concurring in part – affirmed the Hawaiʻi Board of Land and Natural Resources decision authorizing the issuance of a Conservation District Use Permit to the University of Hawaiʻi for the construction of the TMT. Associate Justice Michael Wilson dissented from the majority. A Dissenting Opinion will follow. The 73-page opinion was issued on Tuesday morning. We have included a preliminary analysis of the majority opinion below. UPDATE: State leaders began responding to the ruling shortly after it was issued. Governor David Ige announced he will hold a media availability on the decision today at 1 p.m.
“On behalf of the TMT International Observatory, we are grateful for the Hawaii State Supreme Court’s ruling that will allow TMT to be built on Maunakea. We thank all of the community members who contributed their thoughtful views during this entire process. We remain committed to being good stewards on the mountain and inclusive of the Hawaiian community. We will honor the culture of the islands and its people and do our part to contribute to its future through our ongoing support of education and Hawaii Islands’ young people. 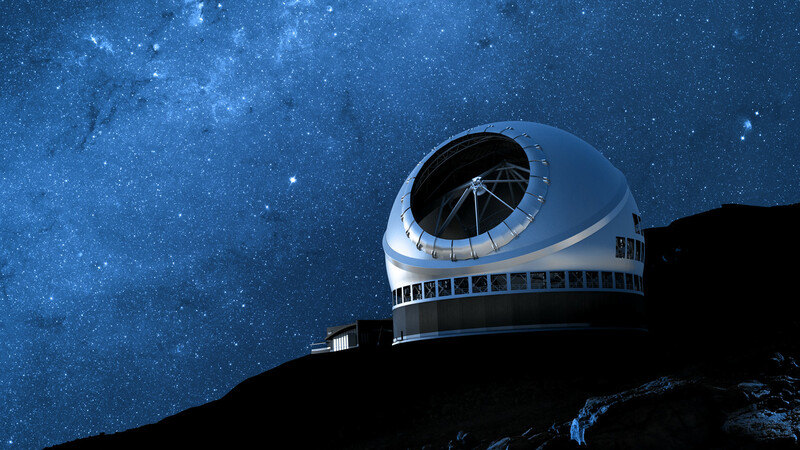 “TMT is poised to make tremendous contributions to Maunakea astronomy and all of Hawai‘i. We are elated that today’s ruling will allow the project to move ahead, enabling numerous local opportunities and the pursuit of scientific discovery worldwide. We look forward to working collaboratively with TMT as they help create widespread economic benefits for Hawai‘i Island and the state. On June 21, the Hawaiʻi Supreme Court heard consolidated oral arguments for three separate appeals from the BLNR decision, which was made in September 2017 following a lengthy contested case hearing. It was the second contested case hearing on the permit. The first hearing also resulted in the issuance of a permit, but it was vacated after the Hawaiʻi Supreme Court ruled that the state did not follow proper procedure. The second and third appeals were brought by attorney Gary Zamber on behalf of the Temple of Lono and seven individual intervenor-appellants. The BLNR applied the correct test for impropriety: whether a reasonable person knowing all the facts would doubt the impartiality of Amano, or whether the circumstances would cause a reasonable person to question Amano’s impartiality. We agree that the circumstances of this case did not rebut the presumption that Amano would be capable of impartially performing her duties. Amano’s connection to ʻImiloa was too attenuated, as her connection was not shown to be anything other than a membership, no different than a membership of a member of the general public. The membership did not represent an unusual commitment to ʻImiloa, different from what any other member might have. Membership alone does not lead to a conclusion that a member supports a mission to build the TMT, even assuming that this is ʻImiloa’s mission. No disqualifying interest was shown and the circumstances did not fairly give rise to an appearance of impropriety and reasonably cast suspicion on her impartiality. For the reasons given by the BLNR, the bases for disqualification asserted in the renewed motion for reconsideration are also without merit. Therefore, there was no error in the denial of the requests to disqualify the Hearing Officer. Whether the BLNR erred by refusing to disqualify Deputy Attorneys General who had advised the BLNR in Mauna Kea I from continuing to advise the Hearing Officer and the BLNR in the contested case hearing after remand. The [Deputy Attorneys General]s have always been required to assist the BLNR in a manner to enable the Board to perform its duties faithfully. Their duty never changed, and they have consistently represented the interests of the BLNR. This differs from [White v. Bd. of Educ., 54 Haw. 10, 501 P.2d 358 (1972).] , in which the deputy attorney general first represented the Superintendent, then the BOE, who could have had differing interests. For all of these reasons, the BLNR did not err in denying Appellants’ motion to disqualify based on White. Whether the BLNR erred by overruling objections to the participation of BLNR members Yuen and Gon in the contested case hearing after remand. The court ruled that both Yuen and Gon’s disqualification were not required by due process, and the BLNR did not err by denying Appellants’ request to disqualify them. The BLNR conducted a thorough analysis as required by the first step of the Kā Paʻakai analysis. The BLNR found no Native Hawaiian cultural resources or traditional or customary practices within the TMT Observatory site and Access Way areas. It correctly concluded that the two ahu constructed on the TMT Access Way in 2015 as protests against TMT are not protected as Native Hawaiian traditional or customary rights. The BLNR found that the TMT Project will not adversely impact cultural resources, whether in the relevant area of the TMT Observatory site and Access Way, or in other areas of Mauna Kea. If the three ahu in the vicinity of the TMT Observatory site are within the relevant area, the BLNR found that the TMT would not affect them. Also, if the summit is considered to be within the relevant area, the BLNR found that the TMT Observatory will not be visible from Lake Waiau, Puʻu Līlīnoe, or Kūkahauʻula, which are culturally sensitive areas of the summit of Mauna Kea, and that the TMT would not impact the other cultural practices discussed above. The BLNR also found that since 2000, cultural and/or spiritual practices have been occurring while astronomy facilities have existed, and that those activities would not be prevented by the TMT Observatory, which would be located 600 feet below the summit ridge. Whether the TMT Project violates religious exercise rights of Native Hawaiians protected by federal statutes. According to the court, Kihoi Appellantsʻ assertions that the BLNR erred “by not addressing the substantial burden and impact the TMT would have on their rights under the Free Exercise Clause of the First Amendment to the United States Constitution” is without merit. Whether the Hearing Officer should have allowed briefing and a hearing on a motion to dismiss based on a request to disqualify UHH as applicant based on its alleged hostility toward the traditional Hawaiian faith. Despite UHH’s reasoning, the tenor of the language in its memorandum was unnecessary. Neither the Hearing Officer nor the BLNR were required to disqualify UHH as the CDUA applicant based on this language, and this argument is without merit. Whether the Hearing Officer should have excluded challenges to the legal status of the State of Hawaiʻi and its ownership of Mauna Kea as well as the existence of the Kingdom of Hawaiʻi. The United States Supreme Court has thus indicated that the process by which Hawai‘i was incorporated into the United States was lawful and binding, and we are bound by this determination. In addition, as we stated in State v. Kaulia, “[W]e reaffirm that ‘[w]hatever may be said regarding the lawfulness’ of its origins, ‘the State of Hawaiʻi . . . is now a lawful government.’” 128 Hawaiʻi 479, 487, 192 P.3d 377, 385 (2013) (citing State v. Fergerstrom, 106 Hawaiʻi 43, 55, 101 P.3d 652, 664 (App. 2004)). The BLNR is bound by the United States Supreme Court’s and this court’s precedents regarding the legal status of the State of Hawaiʻi. Therefore, the Hearing Officer did not err by excluding the proposed evidence. Whether TMT Project violates Article XI, Section 1 of the Hawaiʻi Constitution and public trust principles. In the first opinion by this court in this case, the majority declined to address the application of the public trust doctrine embodied in article XI, section 1 to the potential construction and operation of the Thirty Meter Telescope (TMT or TMT project) on conservation land located on the summit of Mauna Kea, one of the most sacred areas in the state to Native Hawaiians. See generally Mauna Kea Anaina Hou v. Bd. of Land & Nat. Res. (Mauna Kea I), 136 Hawai‘i 376, 363 P.3d 224 (2015). Today, the court only partially rectifies this omission. Although the majority acknowledges the applicability of the public trust doctrine to conservation land, it does not fully apply its principles. In only partially adopting our precedents that set out public trust principles applicable to state water resources, the majority effectively determines that the natural resources the constitution entrusts to the State for the benefit of the people are governed by different measures of protection. Majority at 49 n.23. But neither the text nor the history of article XI, section 1 provides for differing levels of protection for individual natural resources, such as water as compared to land, and this court should not establish artificial distinctions without a compelling basis for doing so. “I therefore write separately,” Justice Pollack wrote. Whether the conditions of HAR § 13-5-30(c) for issuance of a CDUP were satisfied. Thus, contrary to Appellants’ assertion, there are commitments to restore the abandoned Poliʻahu Road and to decommission three telescopes by the time TMT is operational. There is also a requirement to decommission two additional telescopes by December 31, 2033, a commitment to not seek any additional telescope sites to replace the five telescopes that will be removed, and a plan for decommissioning other telescopes, including the TMT. The BLNR also recognized that “[t]he incremental nature of a project’s impacts, standing alone, cannot endlessly justify development within an existing developed area[,]” but found that, “in this case, the TMT Project’s compliance with all applicable rules, regulations, and requirements, the Master Plan, CMP, sub-plans, and the TMT Management Plan, along with the mitigation measures committed to in the TMT Final EIS, CDUA, and TMT Management Plan, demonstrate that the TMT Project will not cause substantial adverse impact to the existing natural resources within the surrounding area, community, or region under HAR § 13-5-30(c)(4).” Because (1) the TMT will not cause substantial adverse impact to existing plants, aquatic life and wildlife, cultural, historic, and archaeological sites, minerals, recreational sites, geologic sites, scenic areas, ecologically significant areas, and watersheds, (2) mitigation measures of restoring the abandoned Poliʻahu Road and decommissioning five telescopes will be adopted, and (3) other measures to lessen the impacts of the TMT will be adopted, the BLNR did not clearly err in concluding that the TMT will not have a substantial adverse impact to existing natural resources within the surrounding area, community, or region, as prohibited by HAR § 13-5-30(c)(4). The BLNR cites to various measures, including the removal of telescopes from the summit ridge, which will be taken to preserve the natural beauty and open space characteristics of the land. Furthermore, the University formally committed that this is the last new area of Mauna Kea where a telescope project would be sought. The BLNR’s findings with respect to HAR § 13- 5-30(c)(6) are not clearly erroneous. Whether the original CDUA should have been stricken and a new CDUA required. Appellants assert they were not given an opportunity to comment on the actual entity for which the CDUP was ultimately intended. Appellants had ample opportunity during the contested case hearing, however, to comment on TIO, challenge its participation by opposing its admission as a party, and crossexamine its witnesses. Therefore, this point of error is without merit. What the nature of the proceeding was below, and whether there is an appropriate record on appeal. The Hearing Officer therefore appropriately included in the record on appeal filings from the contested case up until the point in time that the CDUA was originally approved. She then continued the proceeding from that point, with filings and evidence from the second contested case hearing. This point of error is therefore without merit. Whether TIO and PUEO should have been admitted as parties. Whether the Hearing Officer’s scheduling of presentations by the parties violated Appellants’ due process rights. Whether the Hearing Officer improperly failed to provide required rulings and explanations for thousands of proposed findings of fact. The court ruled that appellant Temple of Lonoʻs alleged point of error “that without specific rulings on each proposed finding, a party is left to first search out which proposed findings the Hearing Officer rejected” is without merit. This is a breaking news story. We will update this page as we review the court opinion.